The Kwahadi Dancers are Scouts from Texas who perform authentic First Nations dances connected to the values of Scouting. Their 2006 summer tour will bring them to Ontario and Québec, July 26-31. The Kwahadi Dancers are a Scout Group from Amarillo, Texas. Their first dance was a one-shot presentation at a campfire in 1944. Shortly after this first dance, they started getting invitations to perform for other groups. Besides a short period in the 1950s when the drums fell silent, the Kwahadis have continued to dance and tour around the United States and overseas. Every member of the Kwahadis is an active Scout with another troop around Amarillo. The Scouts make their own costumes and carefully learn the culture so that they can accurately honour the dances and the native people. The Kwahadis are a fellowship of Scouting families who work together to provide leadership and educational experiences for our youth through travel and performances. The great goal for all Kwahadis is to become an Eagle Scout and/or to earn the Venture Ranger Award. Two-hundred-seventy-three Kwahadis have earned the rank of Eagle Scout. Over 1600 boys and girls have earned the right to perform in the Kwahadi show since the first dance in 1944. Over the years, the Kwahadis have presented over 3700 performances in 46 states and overseas. The crew often travels 20,000 miles a year coast-to-coast in their bus to perform and sightsee. They have been honored with the Youth Award for Excellence by the Texas Commission for the Arts and were selected to represent the United States, along with Up With People, and the Brigham Young University Choir, at the International Festival of the Arts in Ammon, Jordan. The Kwahadis perform for community events, fundraisers, and entertainment coast to coast throughout the year. During spring break and during the summer, the Kwahadis are on the road for 10-24 days presenting performances and enjoying educational experiences. The Kwahadis traveled to Hawaii in the summer of 2004, and presented 80 performances in 2005, including 14 performances on a 4000 mile tour across the Midwest and eastward to Montreal. In 2006 the group will tour across the Southern United States in the spring, and will travel to Canada for a series of shows between Montreal and Toronto in late July. Plans call for a west coast tour in 2007. The Kwahadi Kiva Indian Museum is the Kwahadis' home base in Amarillo, Texas. The Kiva is home to extensive displays of materials on the American Indian, performances, and visual arts exhibits. The Kwahadis present many performances at home in the new Kiva. Summer performances are presented on most weekends, the annual Indian Summer Ceremonial can be seen on weekends in late September and into October, and the annual Winter Night Ceremonials on weekends after Christmas. Performances are in the new outdoor Adobe Walls Plaza Theater under the Texas sky, or if the weather does not cooperate, indoors in the new adjacent Kiva Theater. Visitors can enjoy a dinner prior to the show, tour the museum, and watch the performance in the adobe ambience of the Kiva. The Kwahadi Kiva Indian Museum is built in the styles of the Pueblo and Mexican cultures of the Southwest. Adobe walls and viga ceilings (logs) create a unique atmosphere for the exhibits and performances. The Kiva was designed by the late architect, Terrance Doane. The Kiva was opened in June of 2004. 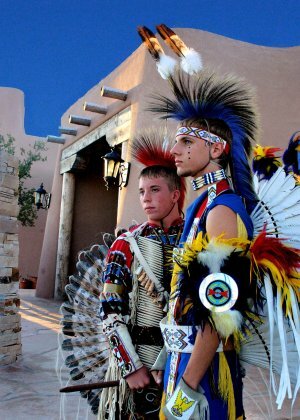 The museum features exhibits of art and material culture of the Plains and Pueblo Indian people along with paintings about the Cherokee culture. The feature collection at the museum is the lifetime work of famous author and artist, Thomas E. Mails. Mr. Mails authored and illustrated 14 books on Native American cultures, mostly at the request of the elders of such people as the Pueblos, Hopi, Apache, Cherokee, and Sioux. The Kiva is also home to the Thomas Mails Research Library, a collection of over 4000 books on the American Indian, along with the field notes, original illustrations, thousands of photographs, and original manuscripts of Thomas Mails which he accumulated throughout his life. The collection was sought by the University of Nebraska and the University of Southern California, but Tom wanted his things to go into a "living museum". His love for the Kwahadi program brought his things from his home in California to the Panhandle of Texas. The museum gift shop, the Kwahadi Kiva Trading Post, provides support to numerous native artists and craftsman who strive to maintain the artistic traditions of their heritage. The trading post offers a wide variety of native products such as Katchinas, potter, Navajo rugs, southwestern jewelry, and collectable material culture items. The Kiva hosts many events including conventions, training programs, school museum tours, tour bus groups, and art shows. The Kiva is also becoming popular for weddings, receptions, and various special events. The Kiva recently hosted the American Plains Artist National Show. For dinner or show reservations, or for information, call the Kiva Trading Post at (806) 335-3175. The museum is open during all performances and is open Wednesday through Saturday from 11am to 6pm and on Sundays 1-5pm. The Kwahadi Kiva Indian Museum is located at 9151 I-40 East, Amarillo, Texas. Phase I of the Kwahadi Kiva Indian Museum has been completed. The Kiva is the fulfillment of a long time dream of the Kwahadi Dancers to build a museum for their collections and a theater to house their performances at home. As funding becomes available, Phase II of the museum will include the construction of an additional museum wing and large theater in the round, the Great Kiva. The museum and performance center has as its primary mission to educate the public and to provide a venue for Native performances and for youth group performances. It is a place "where children are the stars!". The Kwahadi Kiva Indian Museum is owned and operated by Kwahadi Heritage, Inc., a 501(c)3 non-profit foundation operated for the public educational benefit. Kwahadi Heritage sponsors the Kwahadi Dancers, officially Venturing Crew 9 and Boy Scout Troop 9 of the Golden Spread Council, Boy Scouts of America, and Girl Scout Troop 99. The Kwahadis are also members of over 20 Scout troops from many area communities.